Marcus and his mom, Kelly, shortly after his adoption became official in December. There are many heartwarming stories about how children served by The Villages find forever families. 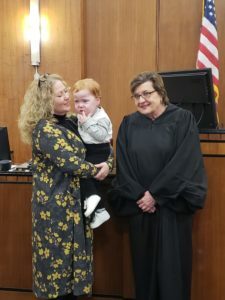 Jennifer Hatfield, a foster care case manager for The Villages in Kokomo, shares the unforgettable adoption journey of Marcus and his mom, Kelly. As a case manager who works closely with medical needs children served by Howard County, I was introduced to Marcus in hopes that I could find him a foster home. At the time, he was at Riley Children’s Hospital being treated for health issues affecting his heart and respiratory system. He was a very lethargic little boy with a trach and vent, who had minimal human touch throughout the day, other than the nurses who changed his diapers or vent settings. One day I was visiting another child in foster care also under medical treatment. I was joined by a foster care manager with the Indiana Department of Child Services who asked about the progress to find a home for Marcus, who was now at another facility. She told me things weren’t looking good for Marcus. He had a trach and continued to suffer from infections (not unusual in facilities with vent children). It was likely Marcus would die in that facility, I was told. Almost instantly, Kelly decided she was going to welcome Marcus into her home and heart. She began to foster parent training and started weekend visits with Marcus a few months later. Marcus was placed in Kelly’s home during the summer of 2017. He blossomed under Kelly’s care. Once unable to sit up on his own, Marcus is now walking on his own! He is off a ventilator and placed on a heat and moisture exchanger. Now, he’s only on oxygen at night. He knows sign language and will start preschool soon. And, the best news of all, Kelly adopted Marcus last month. A child no one expected to survive past his first birthday is now thriving and in a loving forever home. We are grateful for Kelly, who followed her heart, which led her to something she never thought she could attain: Motherhood. The moral of this story is to never give up hope of finding a home for ANY child. They are all so worth it and touch our lives every day. There are many children like Marcus in foster care waiting for loving homes. Learn more about foster parenting at The Villages here.